Posted March 18th, 2012 by Ryan & filed under Blogging, Programming. Need a way to automatically schedule posts for X number of days past your current latest post? On another blog I write a handful of posts at a time and schedule them out over several days. But I have to keep going back and forth to the post list to check dates. This plugin adds a link to the new post page that will automatically set the date for the post you’re working on based on the last post on your site. It’s a subtle little link. Take a look at the screen shot to the right. 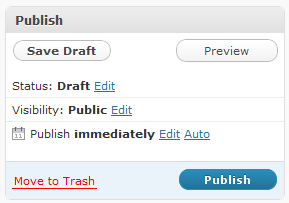 Notice where it says ‘Auto’ next to ‘Edit’. Clicking that will run an Ajax call that will get the next date. Two sets of options for you. The No posts before and No posts after settings allow you to set when you don’t want posts. If you have the settings the same as the screen shot and the plugin would normally pick 6:45am as the time for the next post, it would get pushed to at least 8:00am. The minimum and maximum time between posts allows you to pick how far apart you want to separate posts. They will be at least minimum and no more than the maximum setting. If you want your posts always exactly the same time apart the two times can be the same. One note: The plugin does not necessarily use the date of the last post. If there is a future dated post it will schedule based on that date. If there aren’t any future dated posts it will date based on the current date. I have a question. I want my post to be posted auto at the same time each day at 8:00 AM. How do I do that? Send me a screen shot; please. Second, How often should I post each day? 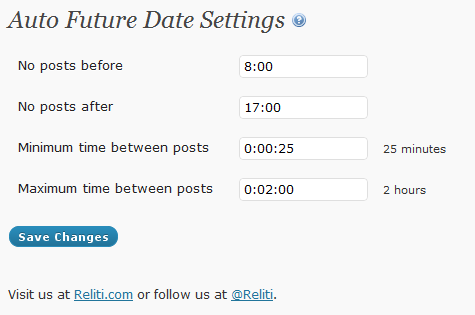 Either set no posts before and after to 8:00 or put 24 hours for both min and max time between. As far as schedule, do what works for you.I could post 20 times a day but 99% of it would be crap. I shoot for a couple posts a week, but don’t usually make that goal.